http://www.JewishWorldReview.com | Janeane Garofalo, left-wing actress-turned-Air America radio host, is a miserable woman. Last week before the holidays, she turned up on cable TV. No, not to count her blessings but to rant against conservative journalist Bob Novak, author Ann Coulter, and the Fox News Channel. She didn't have anything better to do for Thanksgiving? Accessorized by a permanent scowl (hard to believe she was once considered a comedienne), Ms. Garofalo accused conservatives of having "an anger management problem. Without a trace of irony, the frowning Garofalo griped about "right-wing partisan hacks who are always on the verge of punching somebody or always behave as if they've just been cut off in traffic." This, dear readers, is a classic case of liberal projection. 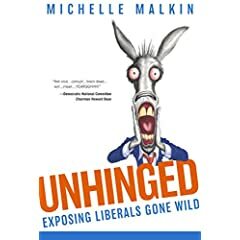 Like CNN executive Jonathan Klein, who derided Fox's audience as full of "angry white men, and those men tend to be rabid," and liberal comedian Bill Maher, who also railed that "Republicans need anger management" and are possessed with a "vein-popping, gut-churning rage that consumes the entire right wing," Ms. Garafolo crossly blames the Right while denying the pathological wrath and fury that characterize the unhinged Left. It wasn't mad conservatives sporting "F*** Bush" license plates, punching cardboard cutouts of the president, and vowing to secede after losing the 2004 presidential election. And for those who support them, Let's get Something Nice And Sparkling CLEAR: Stay The [F***] Away From Me. Stay OUT of my personal space. I want NOTHING from you. I want NOTHING to do with you. I want NOTHING to do with your "vision" of what the world should be.